Hampshire horticulturalists are again showcasing their amazing talents at the world famous Chelsea Flower Show. 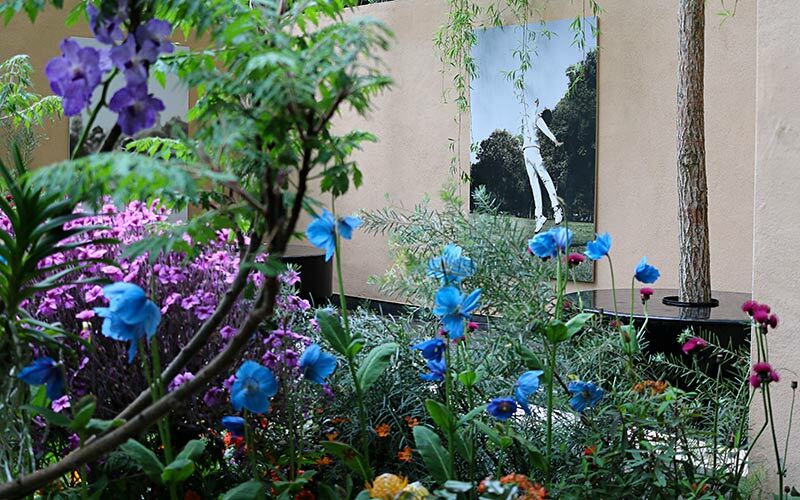 Morgan Stanley returns for their fourth year with Chris Beardshaw to create ‘The Morgan Stanley Garden for the NSPCC’. 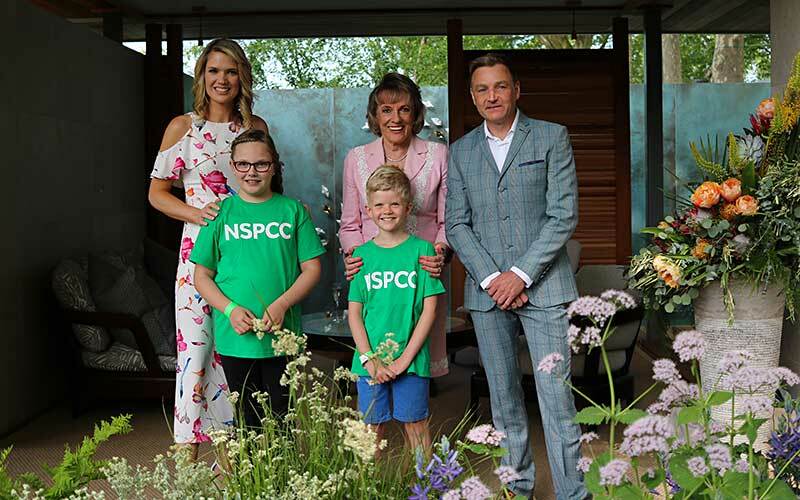 As with previous collaborations, the design reflects Morgan Stanley’s long-term commitment to the wellbeing of children, with this years’ design aiming to raise awareness of the work of the NSPCC, the Firm’s current charity partner. The design is intended to act as a metaphor for the emotional transformation that takes place in a child as they experience the positive impact of the NSPCC’s work, in their fight for every childhood. At the start of the garden the direction of the path is unclear as it moves through the richly planted woodland. As it turns a corner it reveals a more open and tranquil space, filled with soft, textured perennials, before the path provides a step-up onto a bespoke cedar wood pavilion, enclosed at the rear by a calm and reflective pool. Looking out from the pavilion the garden provides a safe, secure and rich sensory environment. Planting will include large specimen trees, woodland and acid loving woodland specimens with subtle foliage textures, greens and splashes of velvety blues, pinks and purples. Towards the late 18th century, secret gardens and tea gardens were the perfect destination in which to socialise, enjoy nature and drink tea. ‘The Wedgwood Garden’ is a modern interpretation of these leisurely spaces, as nature, flowers, horticulture and tea drinking have always been at the heart of Wedgwood’s DNA and design work. An ephemeral pavilion appears to dance over a stream meandering through harmonious planting and naturalistic rocks and boulders. The space can be entered via openings in the planting at the edges, and an almost undetectable path leads the visitor towards a bronze pavilion which appears to change form as you walk around it. On entering the pavilion there is a sunken area which leads to smooth stepping stones across a pond towards a bench, from which the whole garden can be viewed and enjoyed. Salix exigua are dotted throughout the garden, a beautiful willow species which references the iconic Wedgwood pattern as well as weeping feature trees which complement the scale of the curvilinear structure. Bordering the garden is a hedge with Acer campestre and birch trees placed immediately in front in order to screen out the surrounding environment and to afford the space a truly contemplative atmosphere. Hues of pale yellow, periwinkle, inky purple, rust and peach are dotted in the form of flowers and laced through numerous grasses to provide an artistically textured feel. The colours of the proposed planting were drawn from 18th century colour trials carried out by Josiah Wedgwood, the hues of which were often dictated by the metal oxides available for the staining of the clay mixtures. The garden will be relocated to The World of Wedgwood in Staffordshire, a unique, interactive visitor centre experience celebrating the very best of British craftsmanship. The ‘Welcome to Yorkshire Garden’ is inspired by the iconic Dales, a picturesque part of Yorkshire that epitomises the essence of the county. The Dales are world famous for artisan Wensleydale cheeses, quintessential buttercup meadows and rich surrounding flora. Designed by local Mark Gregory, the garden celebrates Yorkshire’s natural materials, traditional crafts and artisan food production. The stone used in the garden will be selected and picked from the Bolton Estate, who are in the middle of a restoration project. Dismantled and fallen walls will be used at the show and then returned and re-built at the estate. 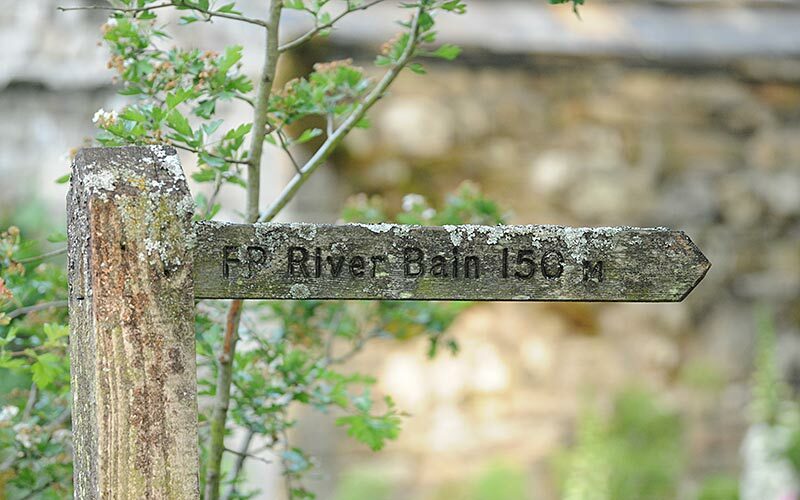 Set on the edge of a woodland with a mixture of dense and varied planting; a fast flowing tumbling beck (brook) runs through the woodland, into the soft grass and buttercup meadowland, past a stone bothy and cultivated cottage garden. Dry limestone walls divide the pastures and separate the garden bothy from the natural landscape. The bothy represents a refurbished outhouse that has been converted into a craftsman’s creamery where artisan cheese is made. Sponsored by Welcome to Yorkshire, the garden is intended to inspire the public to visit this iconic county and experience the culture, calm and serene beauty of the area. The garden is a realistic representation of the Yorkshire Dales, showcasing a buttercup meadow, woodland edge with native trees and cultivated cottage garden. The colour scheme for around the bothy is a take on a classic romantic cottage garden with hints of purple, pink and white. Debut Chelsea designer Tom Massey’s The Lemon Tree Trust Garden is a communal garden designed for a community of refugees displaced in Domiz camp, Northern Iraq. The garden is inspired by the resiliency and determination of people in situations of forced migration and displacement. Their ability to make the most of harsh living conditions and landscapes, and their dedication to create gardens and beautify their limited personal space is profoundly inspirational. The garden will be used as a space to begin to organise the chaos inherent in forced migration, while also providing a sense of normalcy, wellbeing, peace and civility to broken lives. The planting displays what in the UK are exotic fruit trees and includes a pomegranate, fig and five mature lemon trees that provide shade, fruit and citrus aroma. Drought-tolerant planting features throughout the design and bold bright colours add cheer, vitality and life to the scheme. Cultivars of the Damask rose, thought to originate from Syria, are renowned for their fine fragrance, the flower petals are also edible. Scented plants feature heavily with many herbs and edibles also providing exotic scents. The ‘VTB Capital Garden – ‘Spirit of Cornwall’ is a unique creative collaboration consisting of a garden designer (Waterlooville-based Stuart Charles Towner), architects, musicians, a composer and a sculptor; all of whom have been commissioned by VTB Capital. ‘Spirit of Cornwall’ is a multi-sensory experience inspired by the work of renowned British sculptor Barbara Hepworth and music composed by Leo Geyer – which was specially commissioned by the Hepworth Estate and Tate St Ives to celebrate the 40th anniversary of Hepworth’s garden in Cornwall. It has been conceived as a garden for a sculptor and a composer. Contemporary in style, the garden features a palette of subtropical and temperate plants, illustrating the unique microclimates found throughout Cornwall. The metalwork reflects the sound wave pattern of the music, with its peak expressed by the garden pavilion – a space for composing and performing – designed by architectural practice Studio Evans Lane. The metalwork creates a connective thread throughout the garden, much like the recurrent themes and cadences of a piece of music. The steps down to enter the garden, the bridge across the pond and the steps up to the final platform under the pavilion combine with the metal spines running the length of the garden front and back. Water features represent the sea views from Hepworth’s own garden, while the continuous circulation of water reinforces the musical motif and nestled amongst the planting, two metal and acrylic sculptures echo the perceived owners’ use of the garden as a space to exhibit work. Created by sculptor Sheila Vollmer, these pieces have evolved in response to the various threads and rhythms of the garden design, music and architecture. A mixture of subtropical and temperate plants including Corydline australis, Dicksonia antarctica Tetrapenax papyrifer ‘Rex’ and Aeonium ‘Poldark’. The garden is set to be relocated to the Hadlow College’s Broadview Gardens following the RHS Chelsea Flower Show. Hadlow College is a specialist provider of further and higher education for the rural sector set in Kent. The garden will form part of the eight-acre Broadview Garden to be enjoyed by the public. ‘The RHS Feel Good Garden’, designed by twice-winner of the RHS/BBC People’s Choice Award at the RHS Chelsea Flower Show Matt Keightley, highlights how gardening, and simply being in a garden or green space, can make you feel happier and healthier. As part of plans to celebrate its 70th birthday, the NHS and the RHS joined forces to promote this fact. 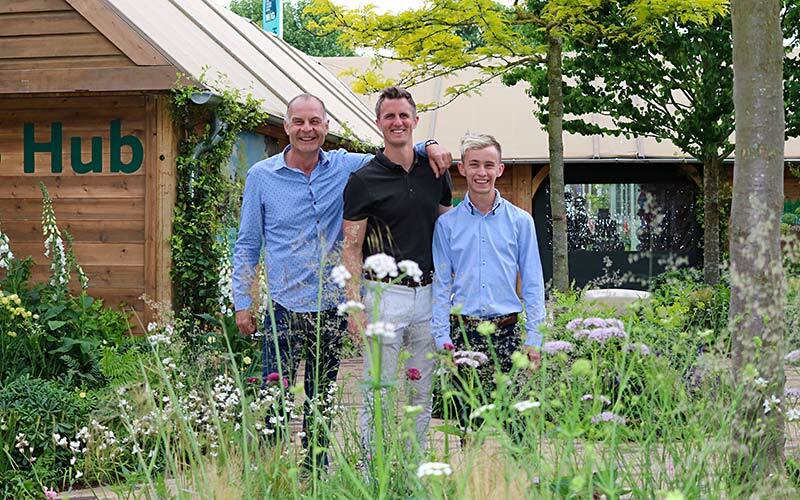 The garden’s design has been inspired by Matt’s upcoming development of a health and wellbeing themed garden at the RHS’ flagship Garden, RHS Garden Wisley, which will open in 2020. An elegant balance of exciting, decisive and restrained planting intertwined with innovative stone work, the garden aims to emphasise the positive impact of gardening and green spaces on mental health and emotional wellbeing in an increasingly stressful and urbanised world. Organic in form, paths have been designed to entice people to move through, pause and quietly contemplate the garden. The layout of the hard landscape provides multiple routes and will leave people wanting to revisit and enter the garden from a different point each time. Full of texture, colour and fragrance, the planting aims to draw visitors towards the corner of main avenue. It is intended to be an immersive experience for people walking through the garden – a pallet that will excite, relax and inspire – provoking the mind to drift and forget our day to day worries and stresses. 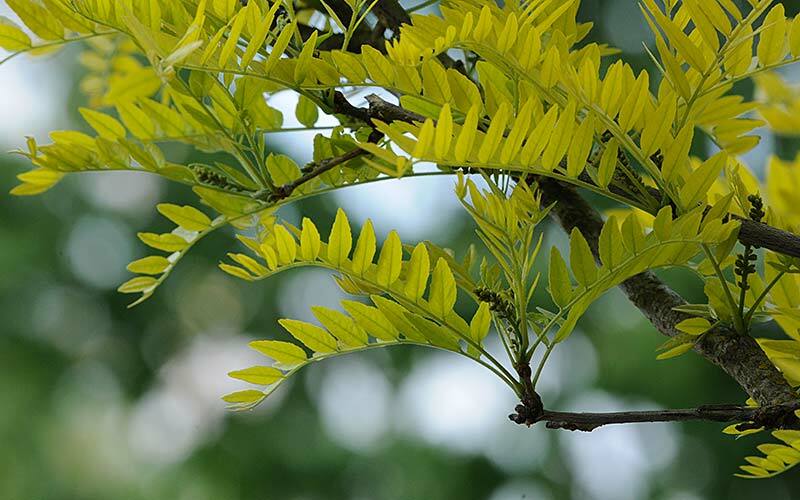 Honey locust have been chosen for their elegant and light canopy, providing the opportunity to populate the space rather intensely without losing too much day light underneath. The tall clear stems will dance through the planting, leading the eye gradually around the garden, whilst the canopy cover aims to create a feeling of comfort and security when among them. Elegant timber benches and stools will be positioned throughout to sit comfortably at deliberate places of poise in order to appreciate certain elements of the scheme, offering a variety of vistas in and around the garden. Given their proximity to the planting it will be impossible not to interact, whether that be brushing up against aromatic plants or running hands through silky grasses. The design of the benches themselves will ensure they are streamline and incredibly tactile. Stone terraces on the corner of Main Avenue will be sculptural in form, seemingly balancing within millimetres of the piece of stone below. Visitors will be encouraged to take advantage of the elevated view points across the garden and gradually work their way around the paths to perch and feel as if they are within the garden itself. Heavy looking stone will be cantilevered and appear to float above streams of fragrant planting. The planting will be a vibrant and elegant mix of perennials & grasses that are punctuated throughout with a combination of evergreen ‘mounds’. Colours are of a cool, muted pallet with bursts of intensity to help draw the eye through the scheme. Textural changes help engage visitors and encourage the mind to drift. The planting envelops visitors and makes them feel completely at ease to look at the garden or move through it. Laced with Hope aims to offer some insight into a child’s journey through cancer whilst highlighting the work of the Supershoes charity. As you walk through the garden, taking each step over the inlaid random riven paving, you become conscious of the words that often form part of a new language of families fighting cancer. The use of artwork to frame the garden is significant as it represents the way the charity uses art on shoes to empower children, and at the same time the subject of the artwork reflects the mixture of emotions and challenges that a child faces as they struggle with an unfamiliar and frightening new norm of treatment, tests and hospitals. The planting scheme has been carefully chosen to work in harmony with the art work, allowing the garden and art to work in unison, in the same way that Supershoes brings so much joy and hope to a child, and becomes part of their journey. The sculptures represent the children and their family, with a lace sculpture running up, over and through the planting, tying the plants, sculptures and the whole garden together. The bench is encompassing and embracing for families, friends and support staff to gather, sit and reflect on the journey. Prunus maackii ‘Amber Beauty’ stem matches the gold lace tying the garden together. For colour matching the artwork will be roses along with perennials these are the key ones:- Rosa Chandos Beauty Rosa Pure Poetry Rosa Westerland Rosa Night owl. This is the first Indian Garden at Chelsea and it marks the end of the UK – India Year of Culture, launched at Buckingham Palace in February 2017. In honour of this, the garden represents the historic and increasingly contemporary ties between our two countries. The garden, designed by Hampshire’s Sarah Eberle, is inspired by the documentary film released in 2017 on the life of Sachin Tendulkar – India’s greatest cricketer. His journey is a metaphor for the hopes and dreams of every young Indian who aspires to wear the country’s blue cricket jersey, serve the nation and hold the world cup in their hands. This aspiration doesn’t only apply to cricket but every young Indian who has the ambition to make a mark on the global stage in their chosen fields. ‘India: a billion dreams’, seeks to celebrate that aspiration through flowers and gardens. The garden structure is inspired by the Moghul gardens of north India and symbolises parts of the game of cricket. It includes Pietra Dura marble work and paintings produced by Artisans in India, a pool, grass crease and stumps as columns. Over 3000 years ago India was part of the then global world where plants, seeds and even textiles made their way along trade routes across the world. The plants chosen have a link with Indian history and will include blue Vanda orchids, Meconopsis, marigolds and roses. The garden is very colourful and energetic to reflect Indian urban living. The planting is a barrage of energetic colour to include familiar bedding plants such as marigolds, red roses, tulips, blue Meconopsis, blue Vanda orchids, jasmine, willow and banyan tree roots carved into stumps. ‘The Seedlip Garden’ is an opportunity to celebrate the most special ingredient in Seedlip’s product Seedlip Garden 108. The pea. As such, everything within ‘The Seedlip Garden’ – the plant palette, forms, colours, patterns and multi-sensory elements – are all relevant to the pea, producing a contemporary and educational compilation in praise of the Pisum sativum. All species of plants used in the garden are from the pea family, Fabaceae, creating a conceptual installation in celebration of the pea & three very important men (Mendel, Lambourn & Branson), from three different centuries, who are responsible for pioneering its cultural, culinary and scientific significance. As many of the Fabaceae species being used in the garden planting scheme are attractive to British native insects, one of the designer’s aims is to inspire the public to grow peas at home in their own garden. The garden also plays host to the world exclusive releases of two new varieties of peas bred by Dr Calvin Lamborn. A garden path, made up of circular elements representing the form of the pea, leads to the elevated ‘Peavilion’, a ‘shrine’ housing a collection of articles relevant to the pea. 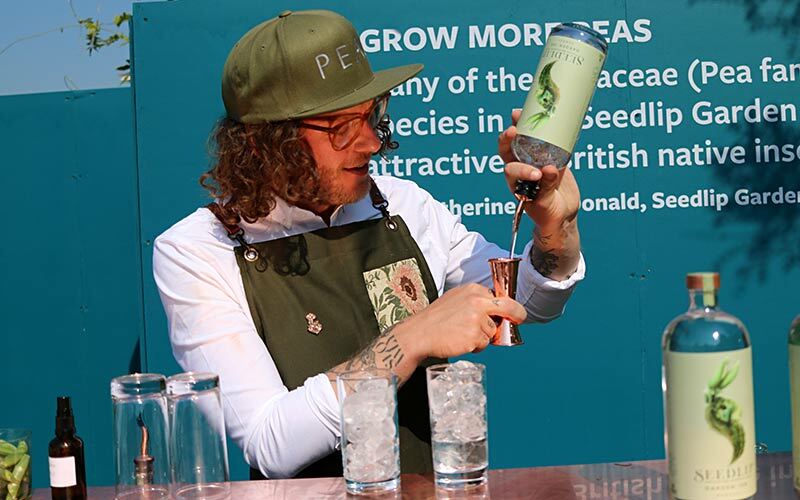 The Founder’s family are pea growers from North Lincolnshire and each year garden pea pods are handpicked and then distilled into the world’s first non-alcoholic spirits. The main plant of the garden is the common garden pea, Pisum sativum, and many of its edible relatives, with unusual varieties of Pisum sativum var. macrocarpon (snow pea, sugar snap pea) bred by Dr Calvin Lamborn also featuring in the garden. The main flower colour palette will be made up of red, purple & yellow to reflect colours of the pods of some of Dr Calvin Lamborn’s sugar snap & snow peas. Elements of the garden, such as the ‘Peavilion’, will be relocated after the show to Seedlip’s farm and the plants are planned to be distilled into a limited edition product. The ‘New West End Garden’ a modern interpretation of the gardens and architecture of a London square, combining environmentally positive technology as showcased in Bird Street, located just off Oxford Street, to creative a modern pocket of green space in the heart of London’s busiest shopping district. A communal garden for use all year round to provide a green oasis in the heart of the West End with positive clean air as well as an energy harvesting technology for residents, workers and visitors to use. The garden is a calm space with lightweight trees providing shelter and privacy from the surrounding buildings for those enjoying the space. Colourful low level planting around the perimeter invites you into the garden. Technology is factored into the design to work seamlessly in the space and not to be a token gesture. The garden is a free standing space with references within and on the boundaries to the architecture surrounding it. This is a small, private corner of a larger space. The vertical boundaries are Ashlar clad which reference the classical architecture of some of the building present in some of London’s most famous squares. The garden also features a sunken space enclosed by vertical green walls creates a relaxing heart to the garden to offset colourful perimeter planning. A classical water features to help mask city noise. Cutting edge paving with integral energy harvesting and clean air (through a pergola) make this garden innovative. A sculpture can be seen from different angles. Rosa Munstead Wood (‘Ausbernard’), Salvia nemorosa ‘Caradonna’, Hosta ‘Empress Wu’, Viburnum plicatum, Sarcococca confusa, with vertical green walls planted with ferns. The main aim of the garden is to increase awareness of HIV, the issues surrounding young people with HIV, and how CHERUB (which stands for Collaborative HIV Eradication of Reservoirs UK BRC) are working to find a cure. The white pod at the top of the garden represents the clinics the young people regularly attend, a cocoon of safety from the outside world. The journey from the pod through the garden shows the journey towards a life of more freedom, and the obstacles encountered along the way, as the path through the planting is interrupted by three dark obstructing walls. Each wall is difficult to pass and is inscribed with words that young people growing up with HIV have chosen to describe how they feel about the stigma, secrecy and the daily struggles they face. The end of the journey is an open seating area, symbolising a society where these young people are accepted without prejudice and feel happy and confident to open up about their HIV, without fear of judgement. The garden has been sponsored through funds raised by the CHERUB collaboration, which is a UK network of doctors, researchers and patients all working together to find a cure for HIV Infection. The timing of the garden coincides with the results of the ‘RIVER’ trial which has taken place in London and the UK, and is the first formal randomised trial exploring a possible cure for HIV infection. The garden showcases how bold design features, colourful and abundant planting, and practical and versatile outdoor living space can all accommodated in a small urban garden plot. Highlighting a vision for water conservation and environmentally considerate landscaping, clever planting is used to deflect and process pollution and excess rain fall, as well as to attract and sustain wildlife. It aims to promote new thought on how homeowners can utilise urban gardens in a brave and progressive way, and to show how to get the very most from their outside space. 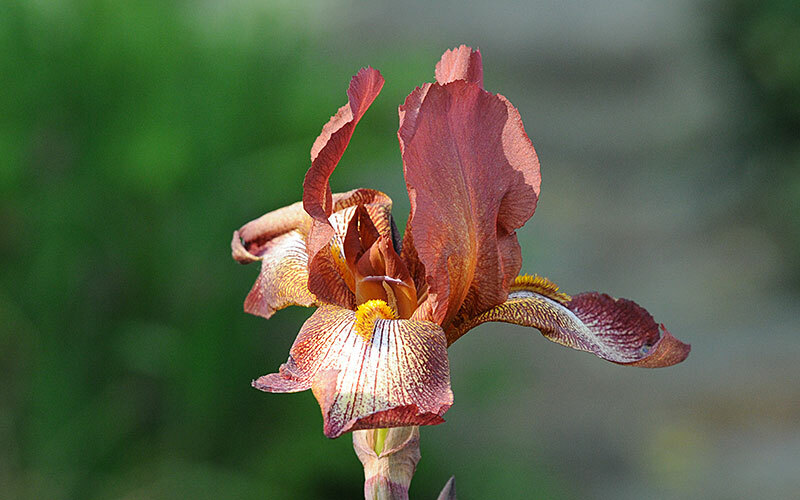 The planting for ‘Ebb & Flow’ has been carefully selected to include a range of plants for biodiversity and to encourage gardeners to select plants not only for flowers but for the stunning leaf colours, leaf shapes, foliage habit and stem interest. Rain garden specific planting pockets are created using tough plants that can withstand varying moisture conditions and shade such as Ophiopogon, and living walls will provide a ‘living larder’ to supply the kitchen with edible flowers, herbs, salad and soft fruit. Materials in the garden are varied and contrasting. From the most traditional hand crafted clay bricks to cutting edge porcelain cladding, the depth of colour and finishes has been carefully curated to provide inspiration for all. Jardin Blanc with Raymond Blanc is nestled in a peaceful corner of the show, and offers a variety of full hospitality options for day and evening. Consultant for the garden is Andy McIndoe. “A Royal Celebration by Hillier” welcomes visitors to the Great Pavilion at this year’s show. At the heart of the entrance is an impressive corten-steel staircases adorned with beautifully royal-themed floral displays. The entrance also features Hillier trees on either side, selected from the 750,000 trees that the company grows at any one time at its Hampshire nursery. Designed by Sarah Eberle, who is also designing the main Hillier garden within the Great Pavilion, will display a celebration of the wedding. 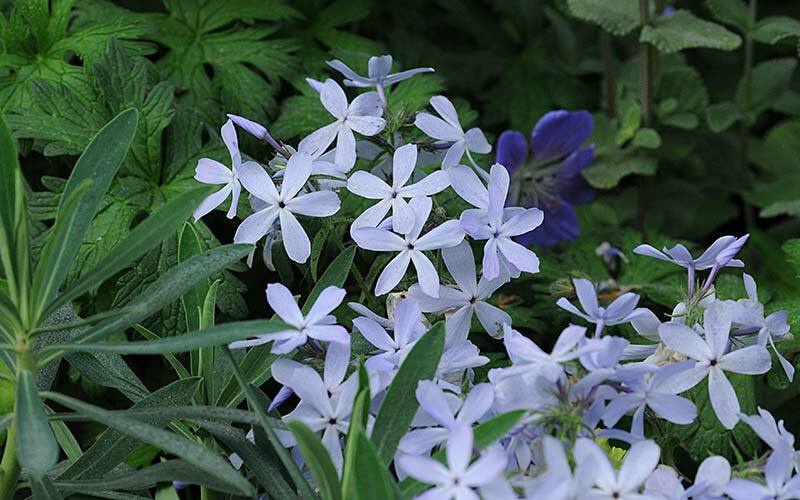 Visitors will discover a variety of regally-themed plants which have been specially chosen by Hillier and Sarah Eberle that take on a bridal theme with lots of white florals selected. Colour is added to the scheme with flowers that selected for their regal names; some of the stars include Lavendula Regal Splendour, Cotinus Royal Purple, Agapanthus Bridal Bouquet, Lavendula Tiara, as well as Hydrangea Kanmara Champagne. The student team at Sparsholt College teamed up with the charity Help for Heroes to create the garden, The Force for Good, which tells the powerful story of the role horticulture plays in the recovery and ongoing support of injured British Armed Forces personnel and their families. 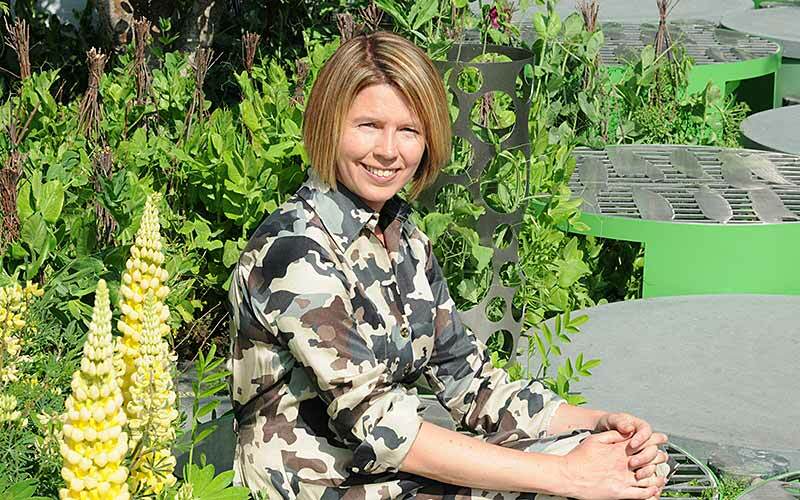 Veteran Chelsea designer Sarah Eberle is back with Hillier Nurseries for 2018, as well as designing for the British Council: India Garden and her own exhibit in the Great Pavillion. Her 2016 Gold medal for Hillier Nurseries in the Great Pavilion made her the only designer to have won Golds in every design category. “STIHL Inspiration” by Hillier takes on a more rustic theme than previously featured in Hillier’s exhibits with corten steel throughout, and orange and blue flowering plants will add warmth alongside the traditional feature of Hillier’s mature trees. Hillier holds the record for the most consecutive Chelsea gold medals and Sarah has now helped them achieve their 73rd. 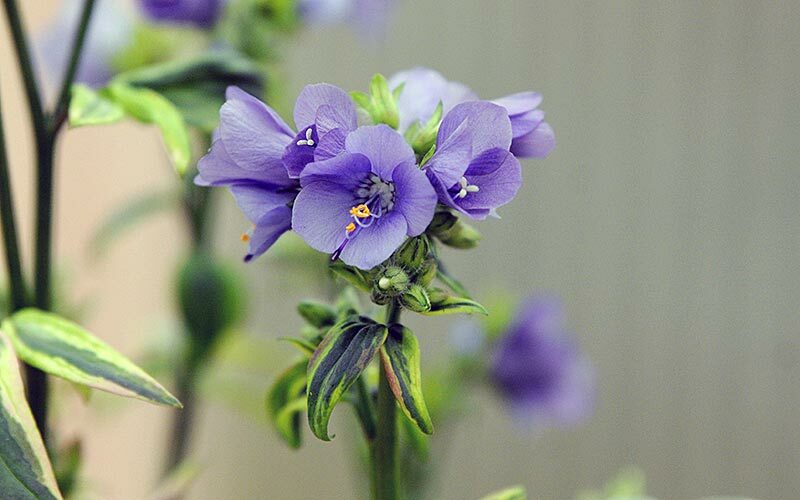 Hardy’s Cottage Garden plants had two plants shortlisted into the top 20: Salvia ‘Kisses and Wishes’ and Polemonium yezoense ‘Kaleidoscope’. 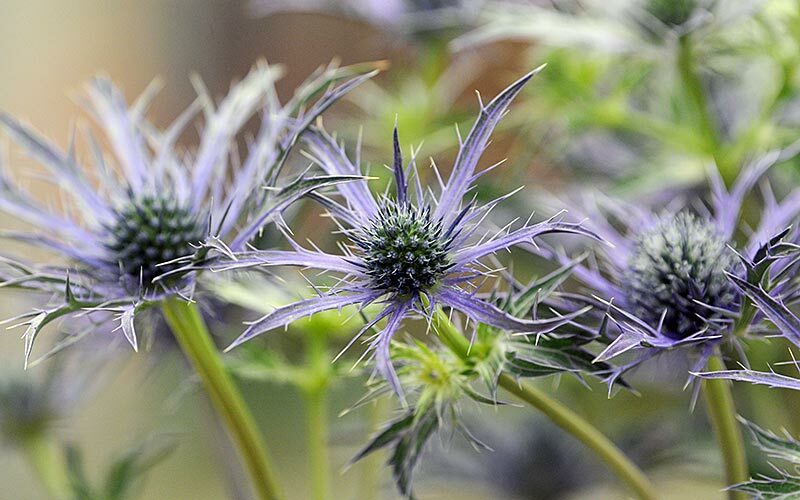 Hillers had Eryngium ‘Blue Waves’ shortlisted but the overall winner was Hydrangea Runnaway Bride Snow White, exhibited by The Sun. Site Number: EA496 Delphiniums in a garden setting.